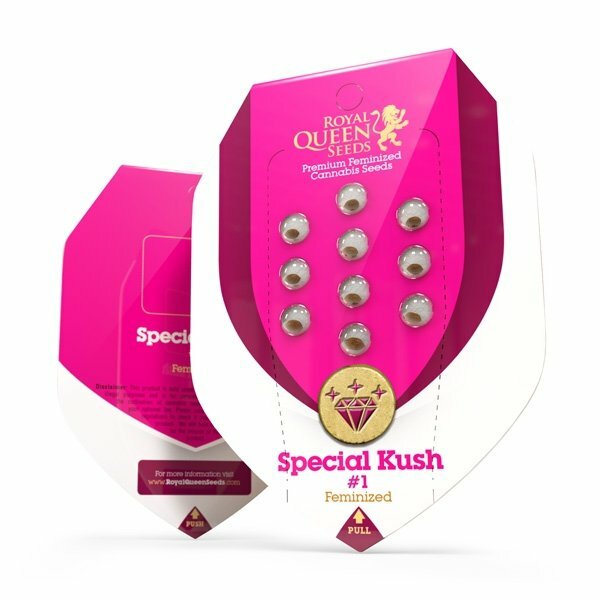 Royal Queen Seeds Special Kush #1 is our great priced cannabis seed, perfect for the grower looking for value for money. If you’re looking for a decent smoke without the heavy price tag, Special Kush #1 is a perfect Feminised Cannabis Seed. Special Kush #1 buds are small and tight nuggets of frosty goodness which are spread all over the plant. Royal Queen Seeds have resurrected and recharged vintage mountain Kush genetics to bring you the Special Kush 1. Visually this strain is reminiscent of squat wild Kush with an amazing flower to leaf ratio, not to mention probably the tightest sugary buds in the game. Special Kush #1 is more than just an homage to heirloom mountain Kush strains. Of course, she will thrive outdoors in a hot dry environment but she is also perfectly tuned for high performance in the grow room. Special Kush 1 is suitable for both novice cultivators and bona fide Kush connoisseurs. Special Kush #1 smoke carries a very hash-like taste with a full body stone present from its Indica genes. When growing Special Kush #1, care should be taken that it doesn't overgrow its space, but given plenty of room it can grow to over 3mtrs tall. It will finish flowering in 7-8 weeks and can yield about 65-150 g per plant indoors, 400 gr per square metre under a 600w light. The Royal Queen Seeds website features a massive 445 reviews with really positive feedback, e.g. Grows really fast, good yields for only 7 weeks of flowering and tastes also good. Good for beginners, not the biggest but tight full nuggets of sweet smelling bud, very reasonable price.